Cao Fei is one of the few artists to successfully integrate contemporary online RPG into her art practice and receive the acclaim of major galleries and art events e.g., Venice Biennale. 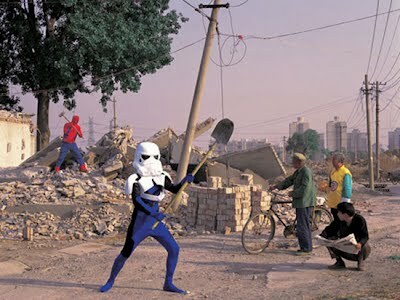 Cao Fei rose to prominence with her Cos and No Cos player series, a documentation of a youth sub culture phenomena in China where a growing number Chinese youth dress up as superhero / manga characters and enact out scenes in public. 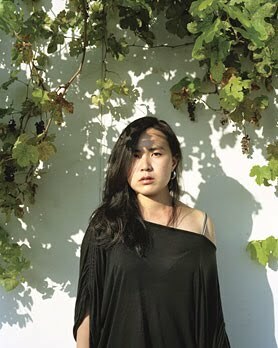 Cao Fei was born in Guangzhou, China in 1978. She earned a BFA from Guangzhou Academy of Fine Arts in Guangzhou, China (2001). Cao Fei’s work reflects the fluidity of a world in which cultures have mixed and diverged in rapid evolution. Her video installations and new media works explore perception and reality in places as diverse as a Chinese factory and the virtual world of Second Life. Applying strategies of sampling, role play, and documentary filmmaking to capture individuals’ longings and the ways in which they imagine themselves—as hip-hop musicians, costumed characters, or digitized alter egos—Cao Fei reveals the discrepancy between reality and dream, and the discontent and disillusionment of China’s younger generation. Depictions of Chinese architecture and landscape abound in scenes of hyper-capitalistic Pearl River Delta development, in images that echo traditional Chinese painting, and in the design of her own virtual utopia, RMB City. Fascinated by the world of Second Life, Cao Fei has created several works in which she is both participant and observer through her Second Life avatar, China Tracy, who acts as a guide, philosopher, and tourist. Cao Fei’s work has appeared in solo exhibitions at the Serpentine Gallery, London (2008); Orange County Museum of Art, Newport Beach, California (2007); Museum Het Domein, Sittard, Netherlands (2006); and Para Site Art Space, Hong Kong (2006). She has participated in the New Museum Triennial (2009); Carnegie International, Pittsburgh (2008); Prospect.1 New Orleans (2008); Yokohama Triennial (2008); and Istanbul, Lyon, and Venice Biennials (2007). Her work has appeared at the New Museum, New York (2008); Walker Art Center, Minneapolis (2007); P.S.1 Contemporary Art Center, New York (2006); and Asia Society, New York (2006). Cao Fei lives and works in Beijing. Contemporary discussion on China is saturated with superlatives that attempt to reflect the dramatic shifts that have taken place within the lifetime of artist Cao Fei, (born in 1978) from collective idealism to a more individualistic consumption-centred society. As a native of Guangzhou, one of the first cities to feel the effects of globalisation, Cao Fei continues to occupy a unique position with regard to generation and geography. Old enough to retain some vestigial memory of earlier times and of the clashes between traditional and capitalist materialism, yet also young enough to naturally gravitate towards new technologies and means of communication, she is concerned with transitional ideologies and media. Her work responds to China’s rapid urbanization and the giddying pace of social and economic development. She depicts states of transformation within a youth culture heavily influenced by Japanese manga and anime and played out against an ever-expanding cityscape. Cao Fei’s key theme is utopia—escape. She became initially well known for her video Cosplayers, documenting a subculture where people dress as manga and movie characters and play out fantasy lives. She followed this with Whose Utopia, filmed in a bleak factory. Workers pursued mind-numbing work only to reappear as musicians and dancers performing in the same space. Most recently Cao Fei has staged works on the Internet in Second Life, most notably RMB City (RMB being Chinese currency). RMB City is a spectacular utopian/dystopian island-metropolis, where candy-striped smoke stacks suggest continuous industrial production, missiles make unremitting preemptive strikes, and ships move goods swiftly in and out of port. A giant shopping cart, filled with skyscrapers and religious monuments, floats nearby. Even before graduating from art school, Cao Fei began climbing the ranks of Chinese artists. Filming 1999’s Imbalance 257 with little training, she struck critics with her awkward, innately effective style that emphasized a documentary-like approach. In the work, Cao Fei captured the lives of fellow students at her art school, and she has often revisited the topic of China’s post-communist generation. In cosplay — slang for “costume play” — people emulate the appearances of fictional characters. Cao Fei’s extensive series began by following Guangzhou youths, dressed like their favorite Japanese manga heroes, romping through their hometown. Gilded and winged outfits hearken to the future and far-away cultures, but gray cement overpasses and towering skyscrapers prevent any escape from the struggling city. In her more recent series, Cao Fei casts older Beijing residents in the same absurd roles and inserts them into typical street scenes. For Cao, a native of Guangzhou, the manufacturing boomtown in southeast China, that means creating short films and video installations that juxtapose escapist fantasies with the workaday realities of life in modern China. Her “COSPlayers,” a 2004 DVD and photo series, for example, depicts teenagers dressed in the vibrant colors of Japanese anime characters—gold body armor, purple tunics—striking poses against the gritty backdrop of Guangzhou’s sprawling skyline. Her 2006 video installation Whose Utopia follows a similar theme: Actual workers at a Siemens lightbulb factory play out their hidden dreams—jamming on guitar, performing ballet—amid heavy machinery on the assembly line.